The hostel was conveniently located and great value for money. The beds were comfortable and we had an attached bath. There was cheap parking available too. Having additional bathrooms was also nice. The hostel has a cozy vibe. Great value for money! I stayed for a long weekend, with friends. We only had a minor issue- the main light in the room wasn't working. Other than that, our stay was wonderful. Great value for money. convenient, very close to the centre and helpful staff. Even though the location was central there was no hustle and bustle. Clean bathrooms and showers.I didn't try the breakfast but it looked good and others seemed to really enjoy it. 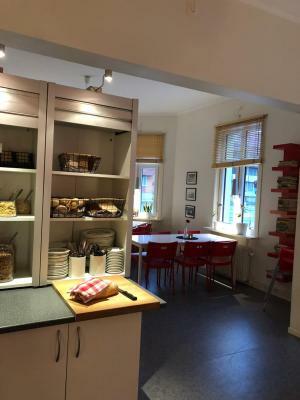 Great location; just by the city center. 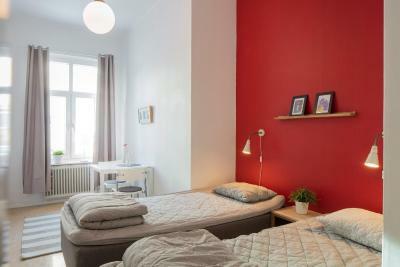 Super clean rooms, toilets and shower rooms. 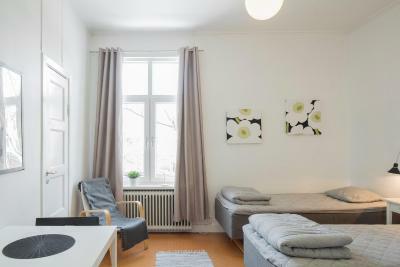 Wide rooms and comfortable beds. Good internet connection. Lamps and access to power outlets for every bed. It is generally quiet though I stayed on the first floor and heard a lot of noise from upstairs in the afternoon; during sleep hours, it was all ok. The breakfast includes boiled eggs <3. Very close to the centre and a very simple format. The room was arenaged nicely with plenty of space to move around without being in someones way. Beds were really comfy! Location and price is the best. 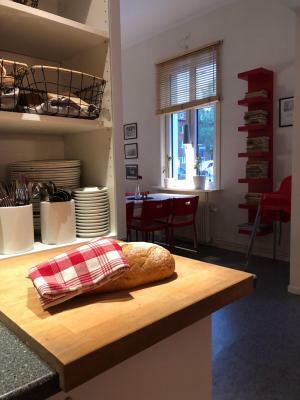 The kitchens have everything you need and eating spaces are nice. It was no problem checking in late and checkout was very smooth as well. Perfect for a quick overnight stay. STF has a friendly admosphere. Ther is a cosy 'living'-room. And the personnel is very friendly. Good quality hostel, my room had a private toilet and a shared shower so better than I expected. Access to kitchen and ICA around the corner means I didn't take breakfast (which seemed a bit overpriced). Room size is excellent, even though my 'private' was in fact a 4 person dorm that I had to myself. Wifi was good too, as were the shared showers. Located by European Route E4/E12, this hostel is centrally located and just 650 feet from Umeå’s main street, Storgatan. 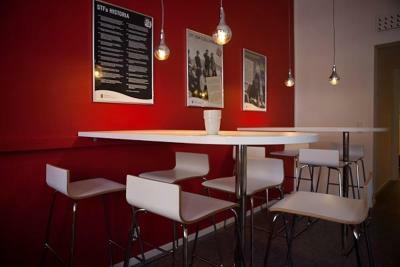 It provides free WiFi internet access, a breakfast buffet and 2 fully equipped communal kitchens. 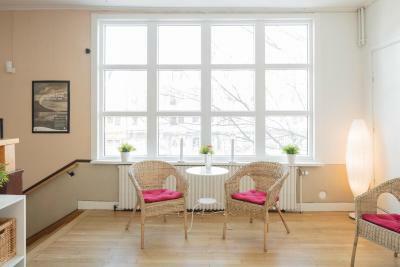 Set in an early 1900s wooden building, STF Vandrarhem Umeå offers modern rooms with simple yet colorful décor. Some rooms have a private toilet, while showers are shared. Each floor features a common room with TV. 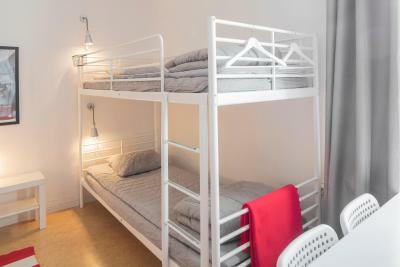 Guests have free access to communal laundry facilities. Umeå Central Station is 10 minutes’ walk from STF Umeå. The Ume River is less than 1,000 feet away. 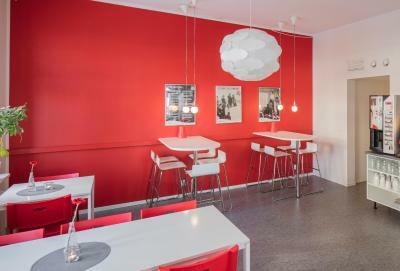 When would you like to stay at STF Hostel Umeå? Includes a seating area. Shared toilets and showers. 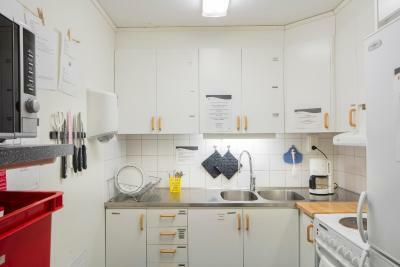 Private parking is available on site (reservation is needed) and costs SEK 50 per day. This room has a private toilet, while showers are shared. Includes a seating area and a private toilet. Showers are shared. 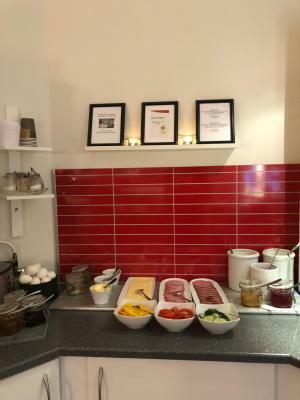 House Rules STF Hostel Umeå takes special requests – add in the next step! 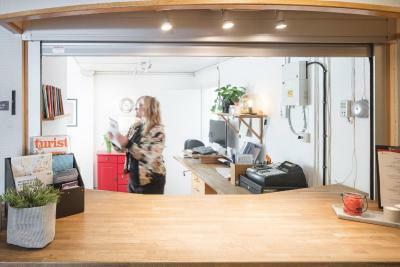 STF Hostel Umeå accepts these cards and reserves the right to temporarily hold an amount prior to arrival. 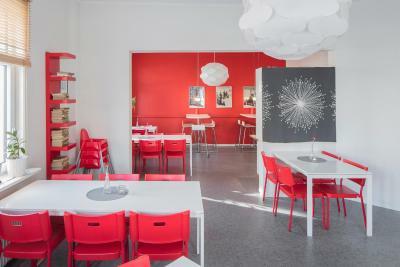 If you expect to arrive after check-in hours, please inform STF Hostel Umeå in advance. Contact details can be found on the booking confirmation. Please note that check-in on Friday-Sunday is before 15:00. 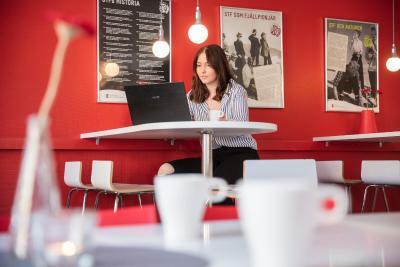 Guests are required to contact STF Hostel Umeå before 14:00 on the day of arrival in order to receive a code for the key box. Bed linen and towels are not included. 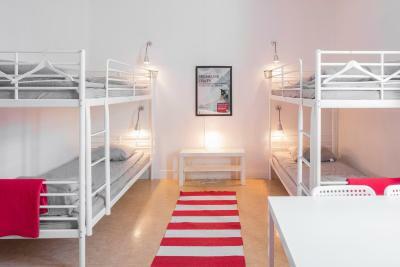 You can rent them on site for SEK 70 or bring your own. Please note that final cleaning is not included in room rates. 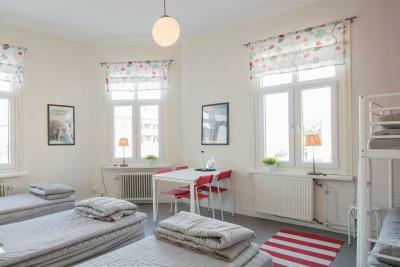 You can clean before check-out or pay a final cleaning fee of SEK 50 per person. 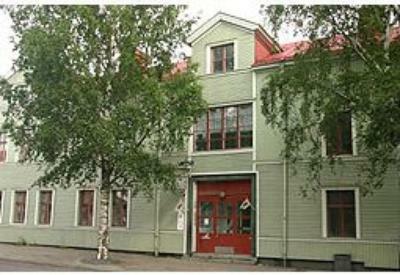 Please inform STF Hostel Umeå of your expected arrival time in advance. You can use the Special Requests box when booking, or contact the property directly using the contact details in your confirmation. No clock in the canteen or a bowl for the corn flakes. Noises could be heard from upstairs when someone walked uncarefully. 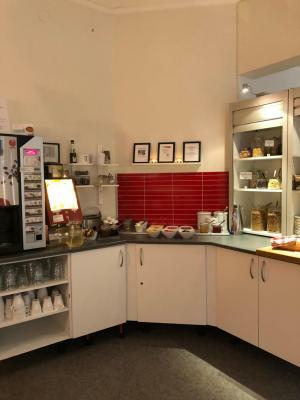 I think it is important for your hostel to add a comment like "Have a nice stay" on the paper information I read about what visiting guests are to know about. After all the information about not smoking, to clean and all that, then it is good to state at the bottom of the paper "Have a nice Stay". I didn't stay long enough to find anything I didn't like. The beds could be better, I woke up a lot during the night. 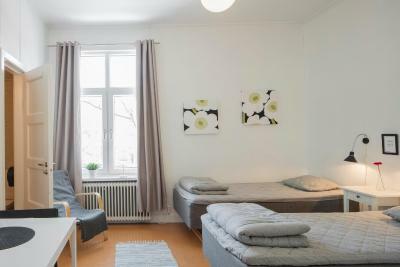 Guests can choose to use own sheets or rent linen. We arrived at 10 pm,, on a moment that the reception was already closed. The key of the room was available in a special box at the entrance. So, that was fine. But there were no sheets available in the room and there was no possiblity to rent them. The fact you have to clean the room yourself or pay a fee, is ridiculous. 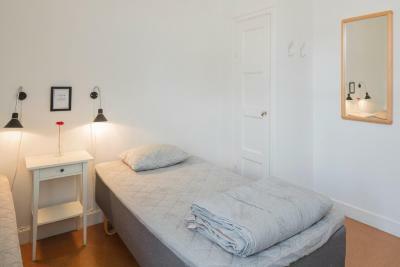 I paid 50+ euros for a private room and then cleaning isn't included? First ever time in 4 years of near constant travel in Northern Europe.